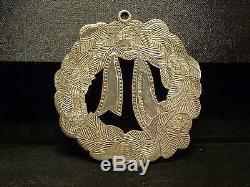 STERLING SILVER CHRISTMAS TREE WREATH & BOW ORNAMENT. 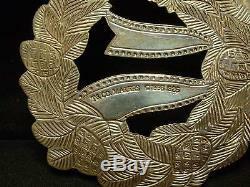 THIS ORNAMENT IS HALLMARKED FOR TIFFANY & CO. IT IS 2-5/8" WIDE X 2-7/8" TOP TO BOTTOM, IT IS A HEAVY PIECE WEIGHING 49 GRAMS. HAS A BAIL ON TOP TO HANG. NO SCRATCHES, OR DENTS, IN EXCELLENT CONDITION. THANK YOU FOR LOOKING, AND CHECK OUT MY OTHER ITEMS. 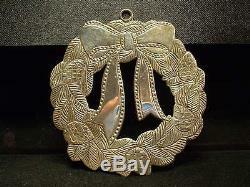 The item "TIFFANY & CO.
STERLING SILVER 925 WREATH & BOW HEAVY TREE ORNAMENT! 1996" is in sale since Thursday, June 22, 2017. This item is in the category "Home & Garden\Holiday & Seasonal Décor\Christmas & Winter\Ornaments". The seller is "jackinthebox1948" and is located in Pittstown, New Jersey. This item can be shipped to United States, Canada, United Kingdom, Japan, Australia, Denmark, Romania, Slovakia, Bulgaria, Czech republic, Finland, Hungary, Latvia, Lithuania, Malta, Estonia, Greece, Portugal, Cyprus, Slovenia, China, Sweden, South Korea, Indonesia, Taiwan, Thailand, Belgium, France, Hong Kong, Ireland, Netherlands, Poland, Spain, Italy, Germany, Austria, Russian federation, Israel, Mexico, New Zealand, Philippines, Singapore, Switzerland, Norway, Saudi arabia, Ukraine, United arab emirates, Qatar, Kuwait, Bahrain, Croatia, Malaysia, Chile, Colombia, Costa rica, Panama, Trinidad and tobago, Guatemala, Honduras, Jamaica, Antigua and barbuda, Aruba, Belize, Dominica, Grenada, Saint kitts and nevis, Saint lucia, Montserrat, Turks and caicos islands, Barbados, Bangladesh, Bermuda, Brunei darussalam, Bolivia, Ecuador, Egypt, French guiana, Guernsey, Gibraltar, Guadeloupe, Iceland, Jersey, Jordan, Cambodia, Cayman islands, Liechtenstein, Sri lanka, Luxembourg, Monaco, Macao, Martinique, Maldives, Nicaragua, Oman, Pakistan, Paraguay, Reunion.